Back in the late 1980s, comic book films were film studio’s kryptonite, nobody wanted to go near them after the disaster that was Howard the Duck’s live-action feature film in 1986. Its hard to imagine how such sure-fire successes comic book films have today that back then it was simply a no go. 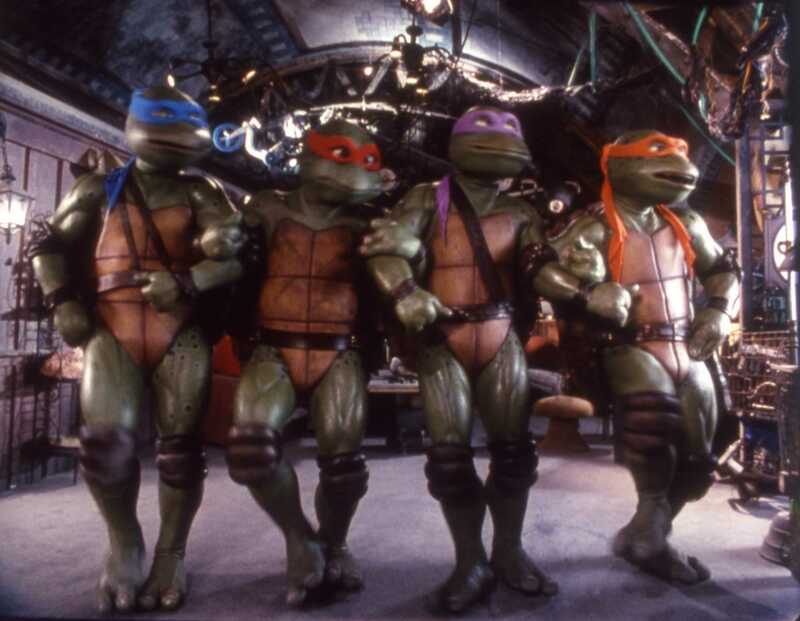 Teenage Mutant Ninja Turtles has a premise straight out of a child’s imagination; four teenage, giant turtles who have been trained in the art of Ninjutsu, who also live in the sewers under New York City and eat nothing but pizza. Long before Michael Bay produced the critically panned Teenage Mutant Ninja Turtles reboot in 2014, the heroes in a half shell started life as a comic book in 1984. Creators Kevin Eastman and Peter Laird first published Teenage Mutant Ninja Turtles back in 1984 as a parody to popular comic book heroes at the time. Appearing first as a black and white comic that had a limited print run in New Hampshire, USA, popularity soon grew thanks to clever marketing and advertisements in comic book circles. The incredible rise to stardom started when a licensing agent contacted Eastman and Laird about merchandising options of manufacturing a line of lead figurines based on the comic. Through the success of the initial toys, Laird and Eastman approached Playmates, a small upstart toy company in California, to produce action figures to accompany the comic book. After the rising popularity of the comic books and action figures, Laird and Eastman thought an idea of a mini-series to help promote the action figures. The animated show lead to being picked up by American cable network CBS which helped catapult the Turtles into the mainstream. The TV show, which ran from 1986 for an incredible 10 years until 1996, became a huge international success throughout this time. The popularity went through the roof in the late 1980s and early 1990s, where you couldn’t go anywhere without seeing Turtles’ lunch boxes, on cereal packets and even food tie-ins. 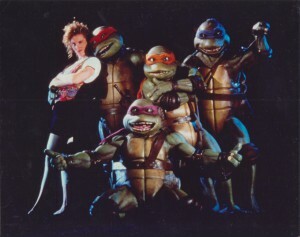 It was at this time that the Teenage Mutant Ninja Turtles wave of success caught the attention of producer Gary Propper, who subsequently persuaded Laird and Eastman to option the film rights. Steve Barron was bought onboard to direct, who had previously worked on successful music videos, including Billie Jean, as well as Bobby Herbeck to write the script. With all the pieces in place, all that was left to do was to find a studio to fund it. At the height of Turtle mania, that shouldn’t be such a hard task. But unfortunately due to past failures and box office flops of Howard the Duck and Masters of the Universe, practically every studio in Hollywood wouldn’t even go near the film. Nobody in the film industry thought a comic book could be turned into a live-action feature film. Having exhausted all possibilities, Propper thought maybe he could try his luck in Hong Kong with Golden Harvest, a production company that specialised in kung-fu films, noticeably Enter the Dragon and other Bruce Lee films. But the first meeting didn’t go as planned. Yet again, the proposed Turtles film fell on deaf ears until they realised they could make the film for very little money in Hong Kong. It was agreed that Golden Harvest would greenlight the production for a relatively small budget of $3million. Then came one of the most important moves of the entire film production, the hiring of Jim Henson and his Creature Shop to design the costumes as well as manage all the required animatronics. Luckily, Steve Barron had worked with Jim Henson before so he approached the legendary man responsible for Sesame Street and the Muppet Show, to join the project. Barron managed to convince Henson to offer his services after doubts crept in due to the violent nature of the original comic books. But even after all of these hurdles, the main problem of distribution still hung over the film’s production. Without the funding behind Teenage Mutant Ninja Turtles, the project could collapse at any moment. In stepped New Line Cinema, who saved the production and at last secured distribution rights and a release. As with any film, the hassles and trials of funding, casting and preparation, nothing ever compares to the actual production of the film. Problems with the costumes, which weighed in at 70 pounds and soon became unbearably hot inside for the actors, and at times even caused meltdowns from the actors who desperately wanted to escape the turtle costumes after every scene. The film finally opened on 30th March 1990 to an incredible success, with kids going wild all over the country for it. Barron claimed that if the film opened to $7million then it would be considered a great success. Little did they know that the Teenage Mutant Ninja Turtles went on to smash all records and become the highest grossing indie film of all time, taking in more than $135million in just the first week.